Here is a scene that had been begging for me to paint it for some time, but I was not sure how I wanted to go about capturing this stark, misty landscape. By happy chance today, I came across the photo of this scene at the same moment that I was searching for something fun and unstructured for one of my watercolor students to do after she had completed a challenging project. 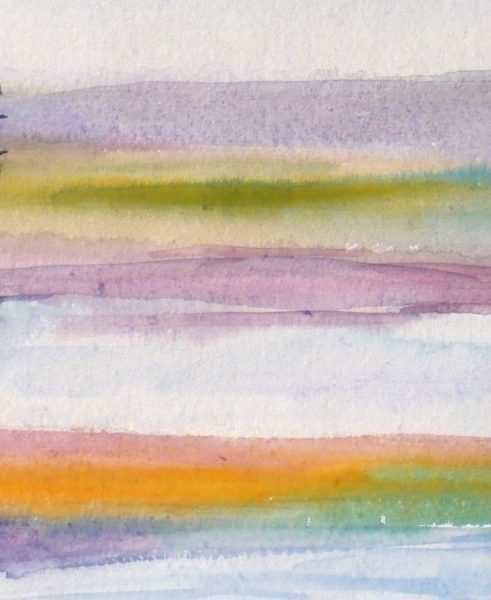 I remembered some handmade watercolor paper that had been stashed away in my studio. It was purchased years ago and I did not like working with it. 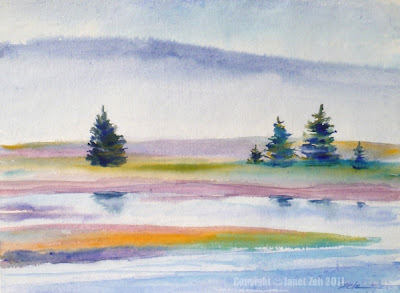 At that time, I painted by layering many washes of color on top of one another and this paper did not work well with that technique. But now, it was the perfect thing! I gave one 11x14 inch sheet to my student and told her that we would relax, have fun and experiment. The other I brought to my easel. I began with the sky and before it dried, painted the top of the distant mountain. The wet paint bled up into the sky giving the impression of tree tops. You can see that in the image to the left. 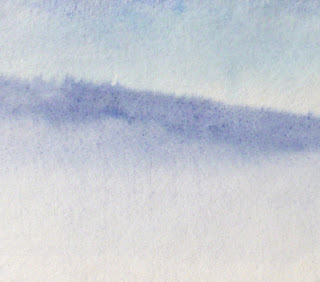 I then used a brush full of water to bring the mountain color down in a very light wash of blue for the mist. Next, I wet the land areas and brushed pure color in - yellow, blue, red - and let them blend together. Before that dried, I painted the water so that some of the land colors would bleed into the water. For the trees, I also wet the paper first in the shape of the trees, then dropped blue and yellow onto the wet paper. Then I added some final details: reflections and ripples in the water. The painting was finished! This method of dropping paint onto the wet, uneven surface of the handmade paper gives it a loosely-painted, impressionist effect. 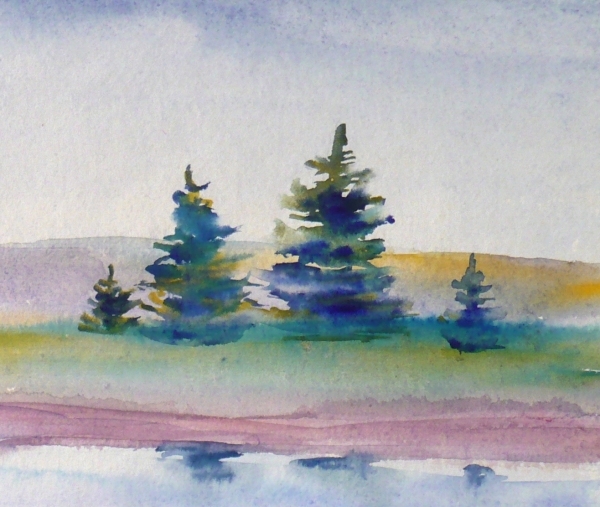 See more of my seascape paintings here. Thanks for stopping by. What do you think of my impressionist experiment?